If you're not in the mood for racing, want to meet people or just want to build your confidence on the water then Riverbanking & Crusing is a great way to do it. Join the Riverbankers on a trip to a local hostelery or you can also cruise during races (as long as you stay out of the way! ), If you would like to get into Racing and are more inexperienced you should also try Wacky Racing (also generally run by our very own Ratty). 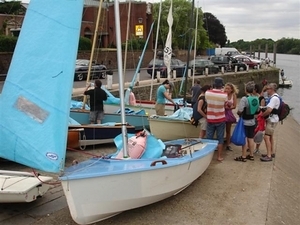 Riverbanking and Wacky Racing are inter-changeable in the Dinghy Calendar as it is often left till the day to decide which is more suitable depending on conditions. Additional Riverbanking trips are usually added to thecalendar throughout the year, with details distributed through the discussion group a few days before. On some spring/summer evenings, and certain Saturdays and Sundays, we cast aside our competitive spirit and enjoy the simple pleasures of messing about on the river or "Riverbanking". Inspired by the Wind in the Willows, Riverbanking is lead by our very own Ratty, helped by Moley and Badger and sometimes hindered by the ever irrepressible Toad. If you come sailing with the Riverbankers a few times you will inevitably end up with your own Riverbanking name. Weekend Riverbanking Cruises usually take around 3-4 hours including a sail down or up the river with the tide, waiting for the tide to change in a local pub and then sailing back again. With several excellent pubs to visit at reasonably short cruising distance, including the London Apprentice in Old Isleworth and the Ship in Barnes we are ideally placed! Once a year we also sail past the houses of Parliament and visit the Ship at Wandsworth. 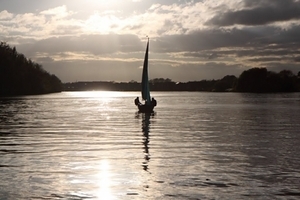 During the Summer months when the tide is right, we also set off for what can be some quite beautiful shorter evenings sails with a quck stopver before coming back (lights sometimes needed! ).